This year has been a good one for planetary observers, we have had good oppositions of Jupiter, Saturn and Mars, and we had all 5 planets lined up in the morning sky, the first time such a line up occurred since 2005. 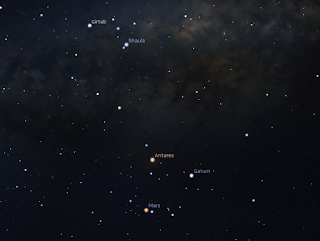 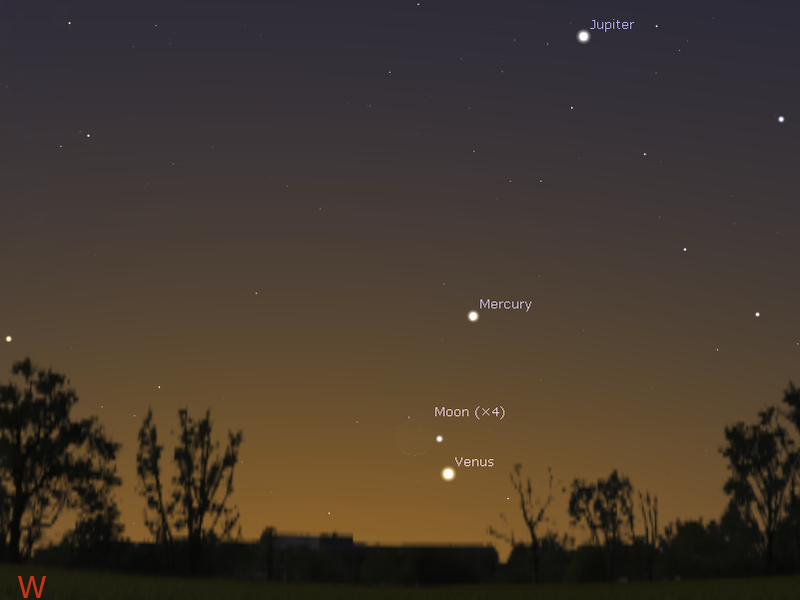 Now we have another fantastic line-up of all bright planets in the evening, which means you don;'t have to get up in the wee hours to see them. 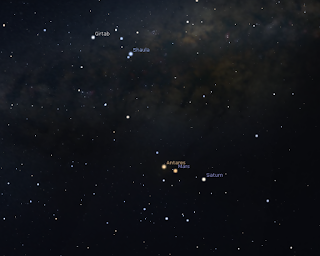 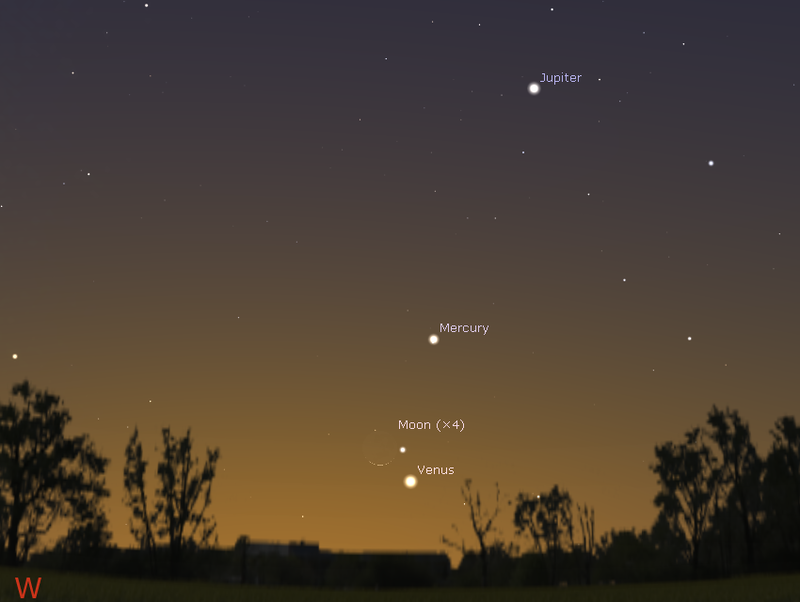 The next time all five bright planets line-up is October 2018, so don't miss out. 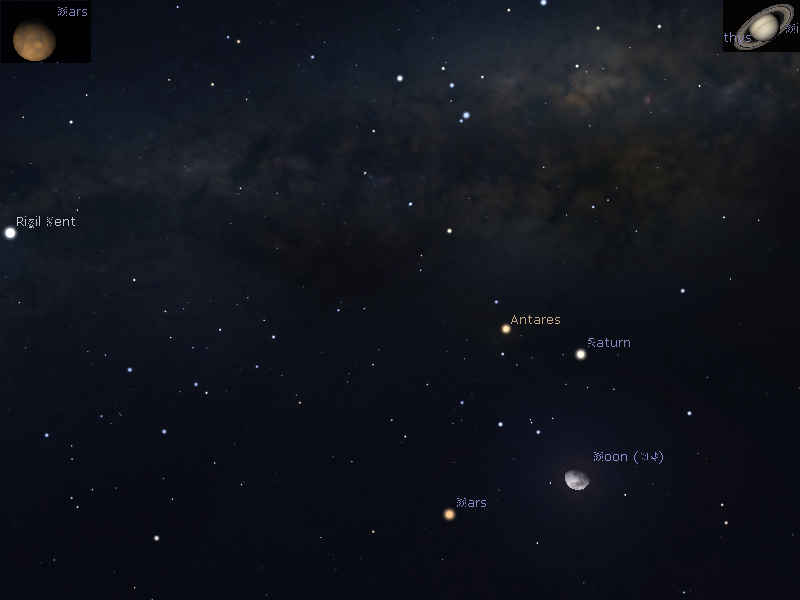 As well as seeing all the bright planets, there are several beautiful encounters between the Moon and bright planets, the planets themselves and the planets and bright stars which will make the coming weeks exquisite. 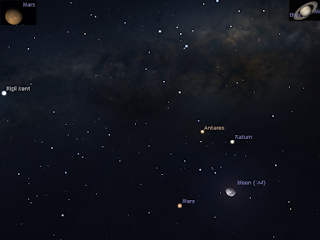 Almost every night will have something new to see. 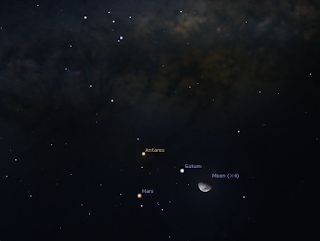 Furthermore you do not need any fancy equipment beyond your eyes (although binoculars or a telescope will be good when Jupiter Jumpsuit* meets the Moon) and it will all be at times when you can show the kids without disturbing their bedtimes. 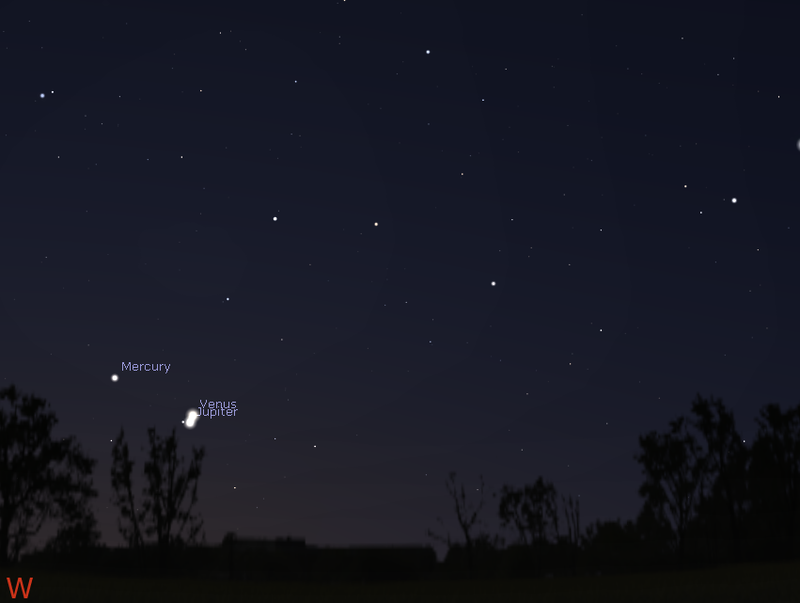 The Planet Dance starts of this and next evening, (Saturday 30 and Sunday 31 July) when Mercury is close to the bright Star Regulus. 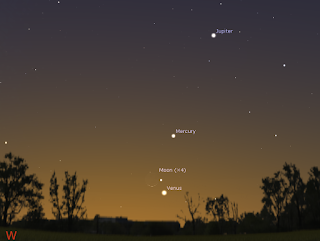 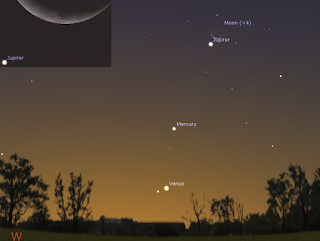 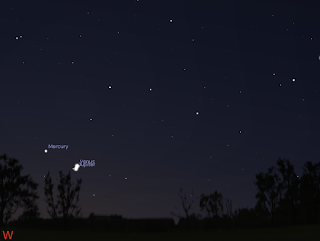 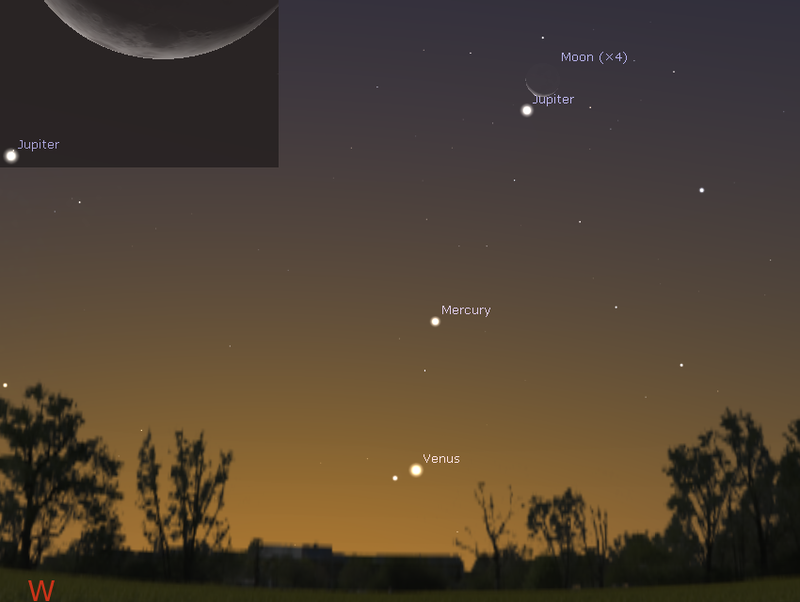 For all of the Mercury and Venus viewing you should look from 30 minutes to an hour after local sunset, with optimal viewing around 45 minutes after sunset (earlier the sky will be too bright to see Mercury easily, later Venus will be too close to the horizon or set). 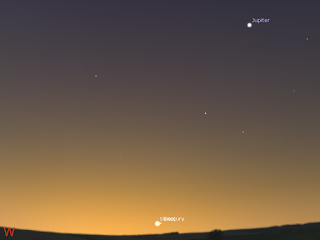 It also helps to have a level western horizon without big trees or buildings in the way. From the 4th, the crescent Moon climbs the planets like a ladder, giving gorgeous views, with the best on the 6th, with Jupiter less than a Lunar diameter from the crescent Moon. 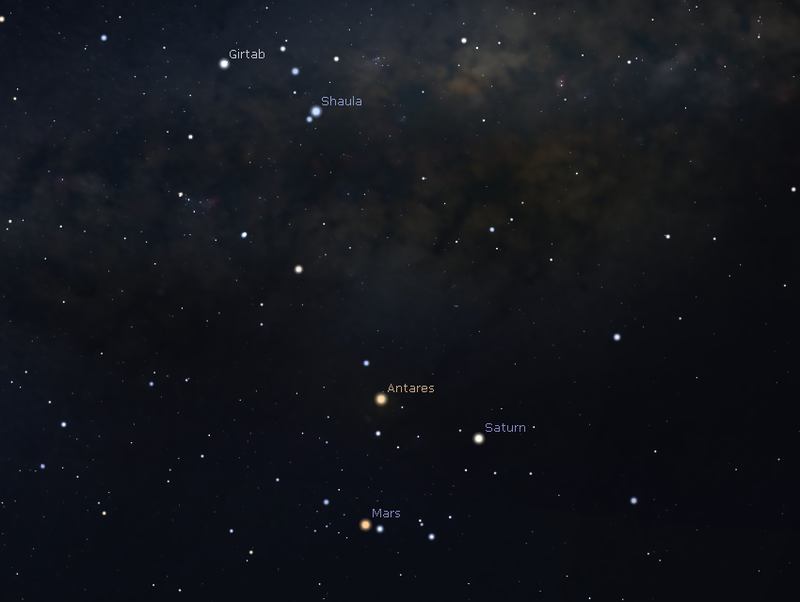 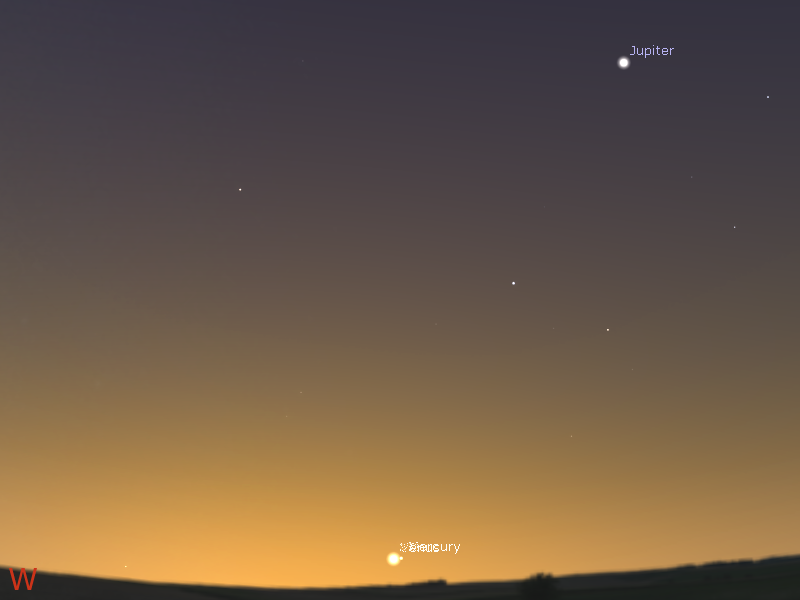 While most of the attention is on Venus, Mercury and Jupiter, Mars and Saturn will be pretty good higher up in the western sky. 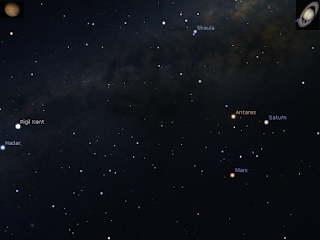 Mars and Saturn from a triangle with the bright red star Antares in Scorpius the Scorpion. 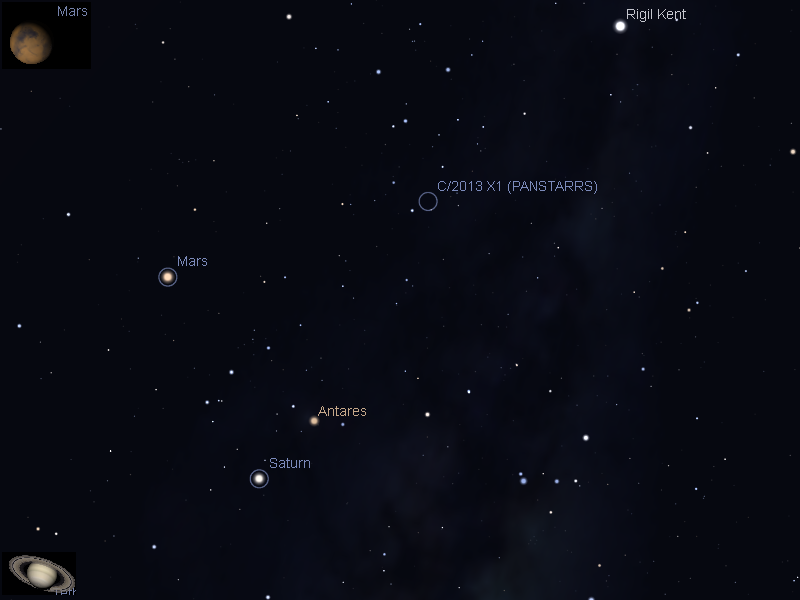 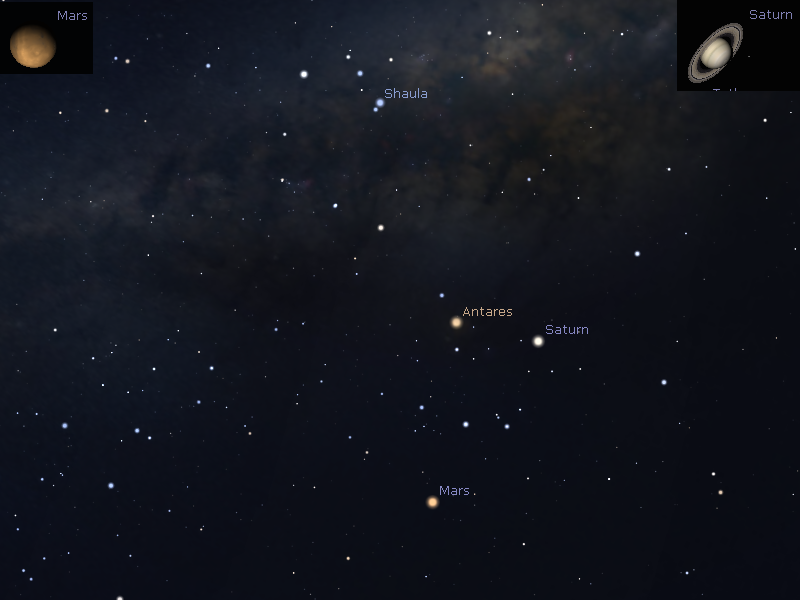 Mars will move through the Scorpion in August. 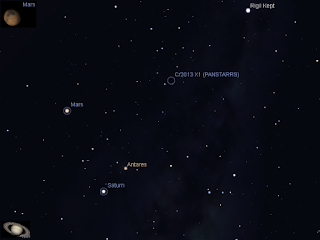 On the 9th Mars is close to the bright star Dschubba in the head of the Scorpion, and on the 24th Mars, Antares and Saturn from a line as Mars moves between Antares and Saturn. 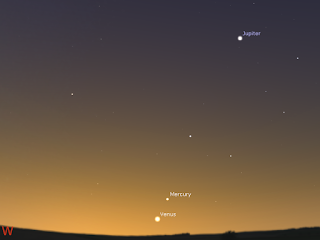 Down on the horizon Mercury and Venus have been moving towards Jupiter. Mercury is closest to Jupiter on the 18th-21st, and in a spectacular finale Venus and Jupiter are less than a Lunar diameter (half a finger-width) from each other on the 27th and 28th of August. 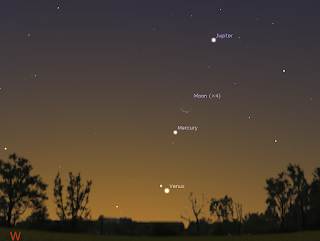 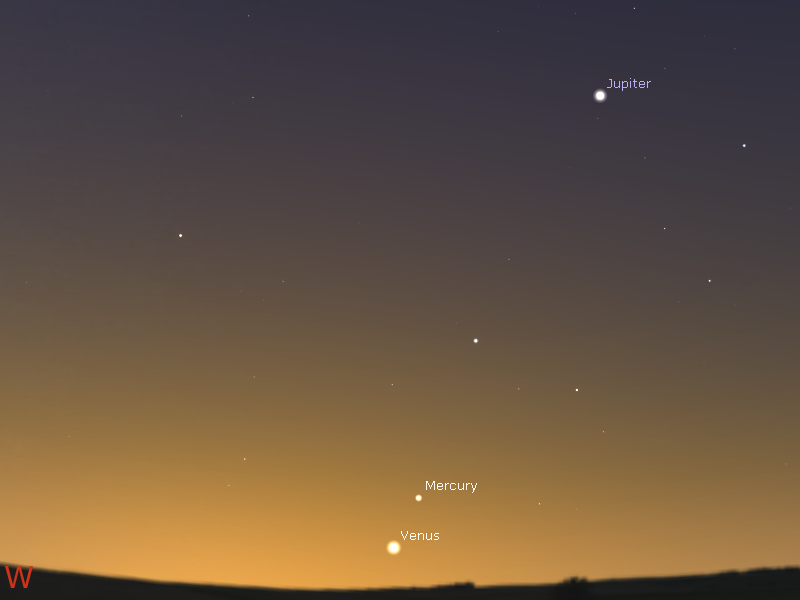 The planets won't vanish after this, and will still be beautiful for the rest of August and early September, until Mercury and Jupiter vanish into the glare of the sun. 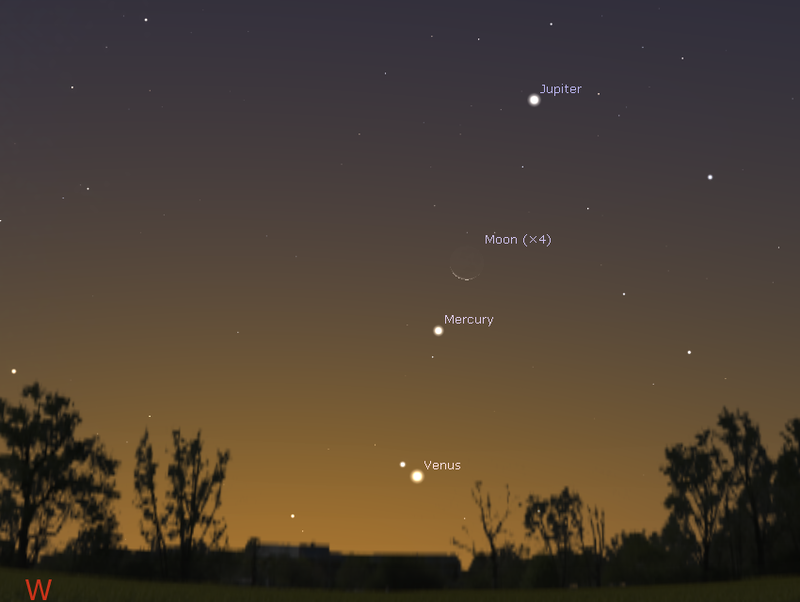 So if you have a chance at all this month, get out and look at the sky. 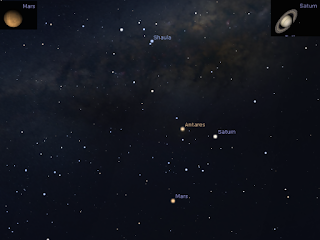 Here is the near-real time satellite view of the clouds (day and night) http://satview.bom.gov.au/ *Don't you love autocorrect! Left the original in for amusement value. 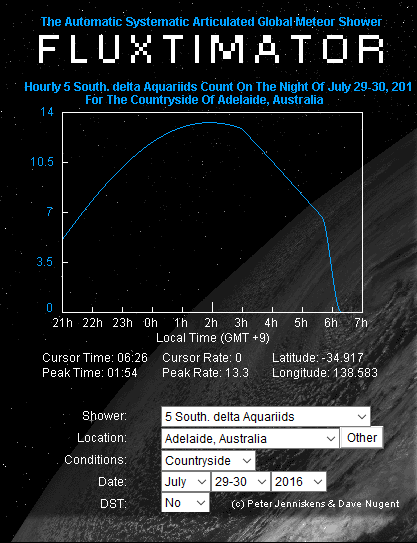 Evening sky on Saturday July 9 looking west as seen from Adelaide at 21:00 ACST. Jupiter is very close to the Moon. 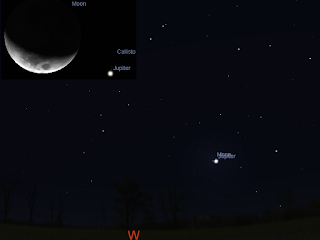 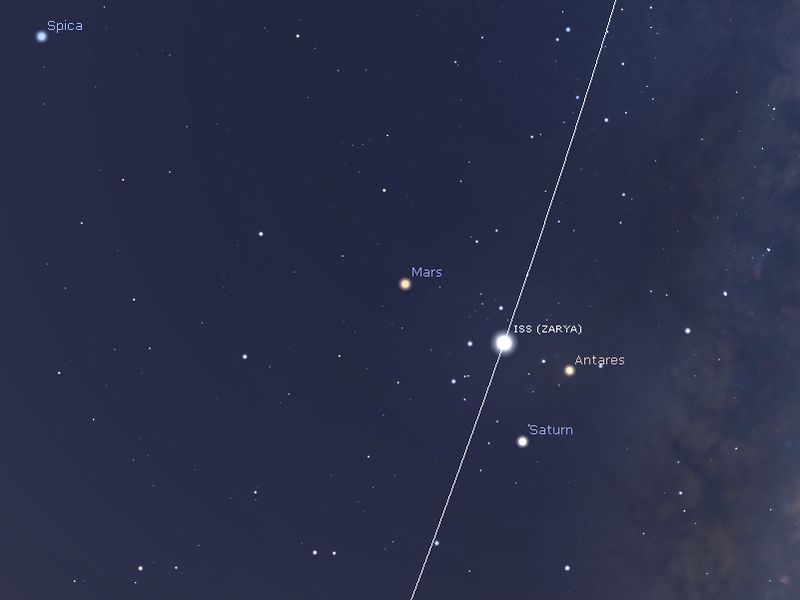 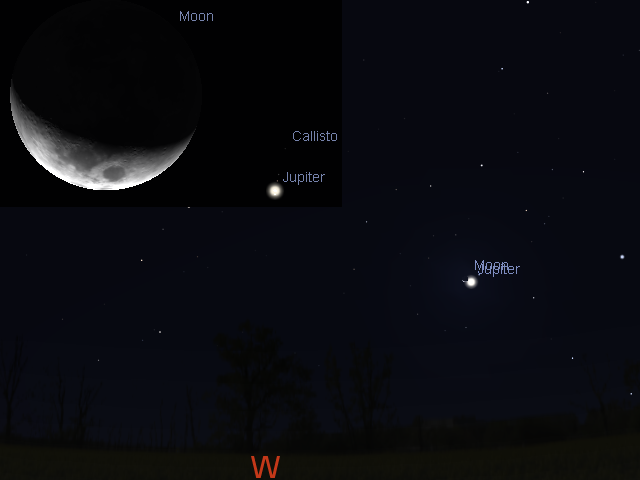 This Saturday evening (9 July), the crescent Moon and the bright planet Jupiter will be very close together, just above the western horizon. 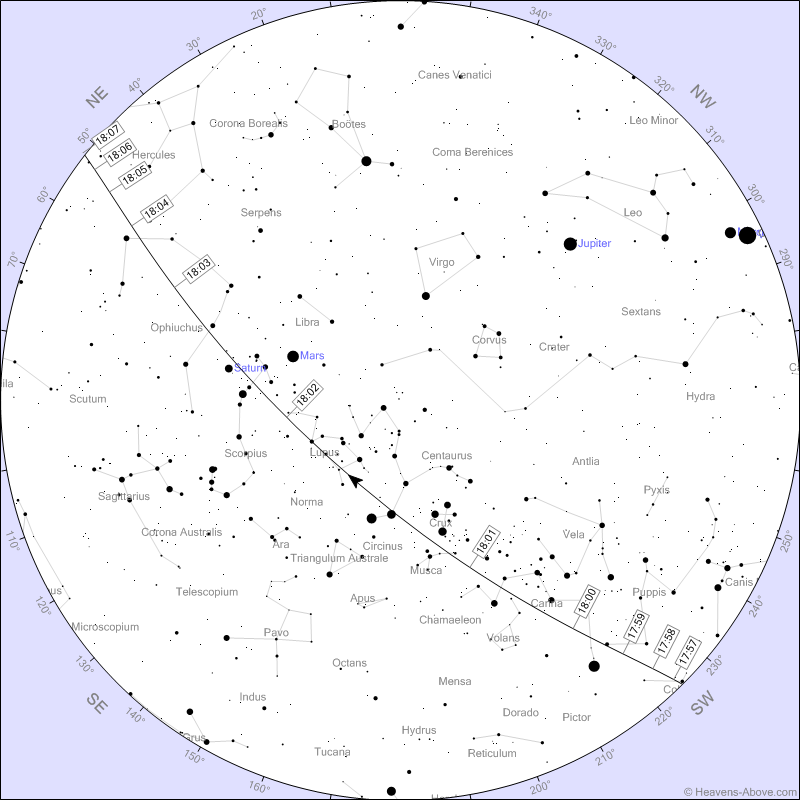 Indeed at their closest from most of Australia Jupiter is mostly less than half a lunar diameter from Moon (that is about a quarter of a finger-width) at around 9:00 pm local time (see table for details). 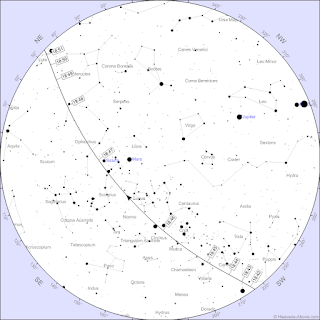 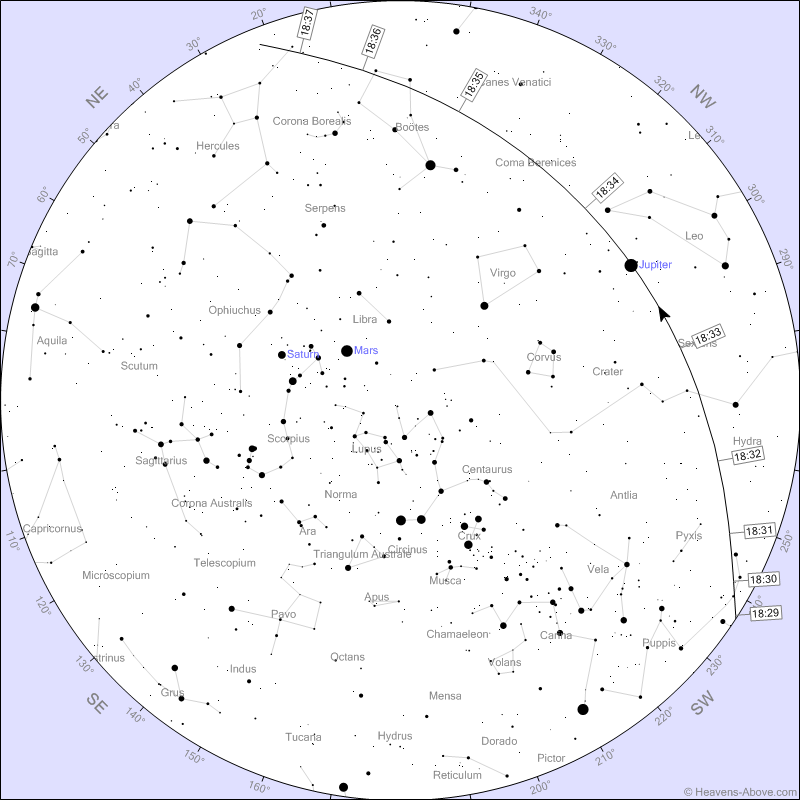 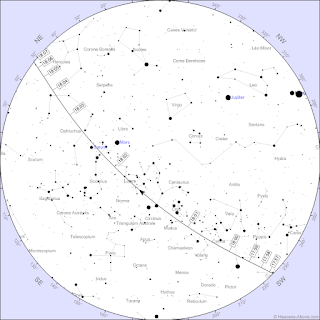 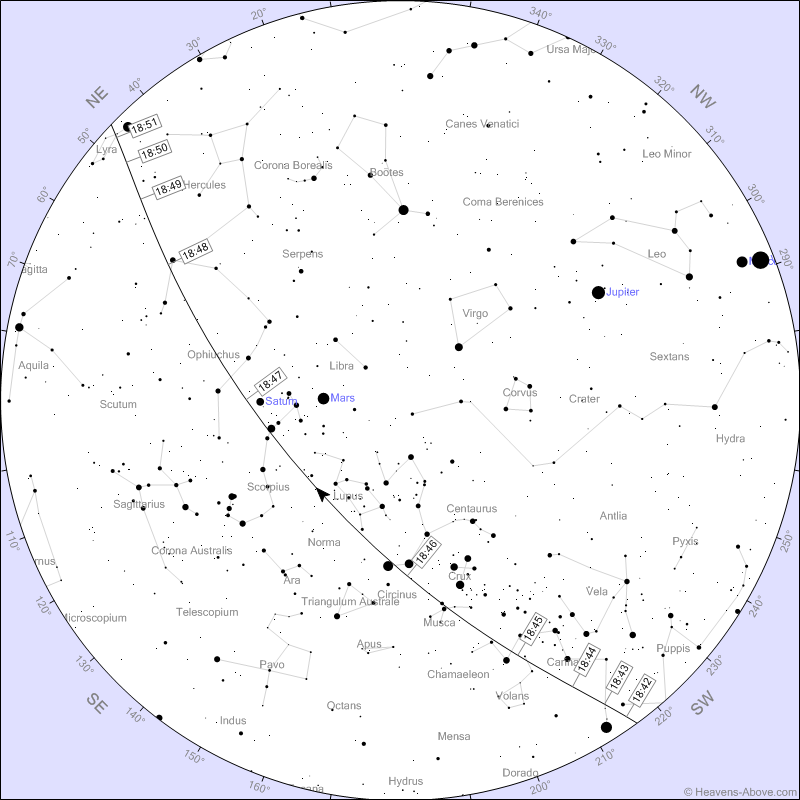 Except Perth, which has a really close view of 11 arc minutes (11', the Moon is 30' wide) just on astronomical twilight (and hour and a half after sunset). 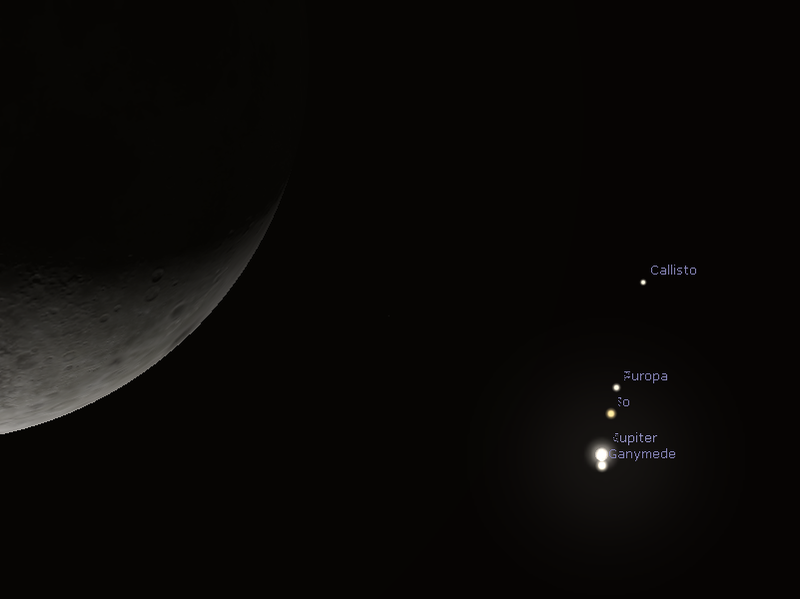 Simulated view of view as seen through a 6" Newtonian reflector, with a 12 mm eyepiece. 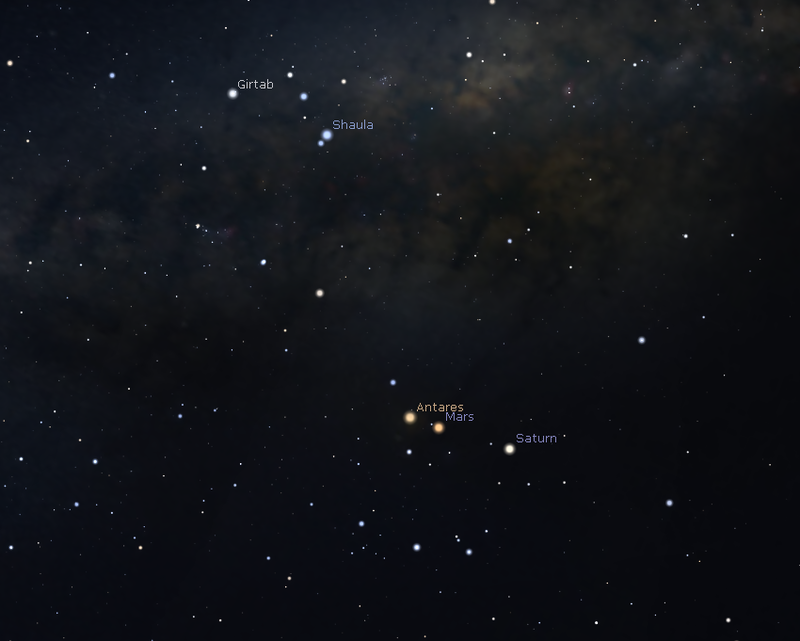 They will be visible together in binoculars and wide field eyepieces of telescopes. 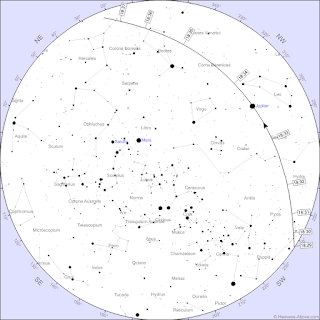 For telescope user, a 24 mm eyepiece (rough field of view 1 degree) will have the pair together for most of the night. 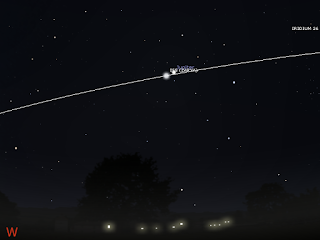 A 12 mm eyepiece will easily fit Jupiter and a large section of the Moon in the same field of view fro around an hour of closest approach, but details of Jupiter's bands may be hard to see. 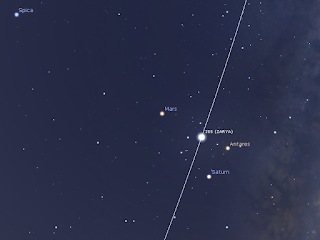 A 7.5 mm eye piece will show Jupiter nicely, but you will not get much of the Moon in (and Brisbane, Alice Springs and Darwin they will be too far apart to fit in the FOV of a 7.5 mm eyepiece. 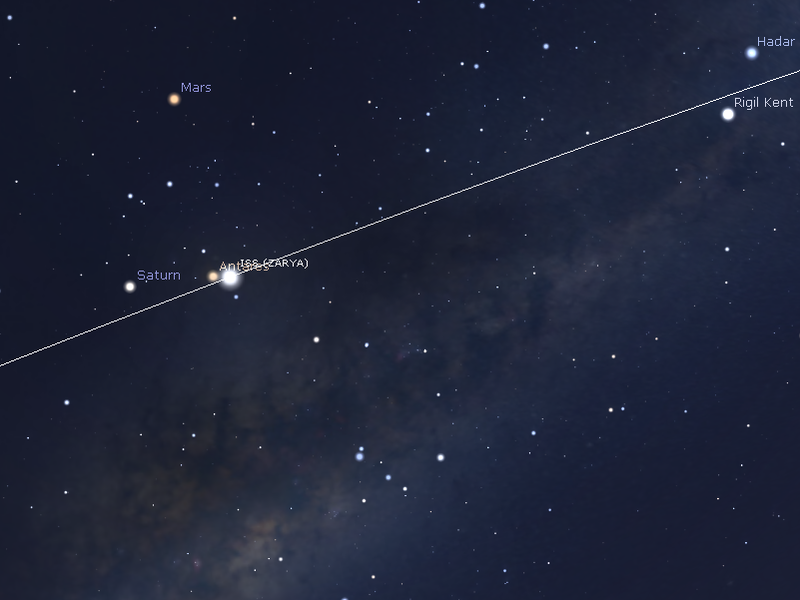 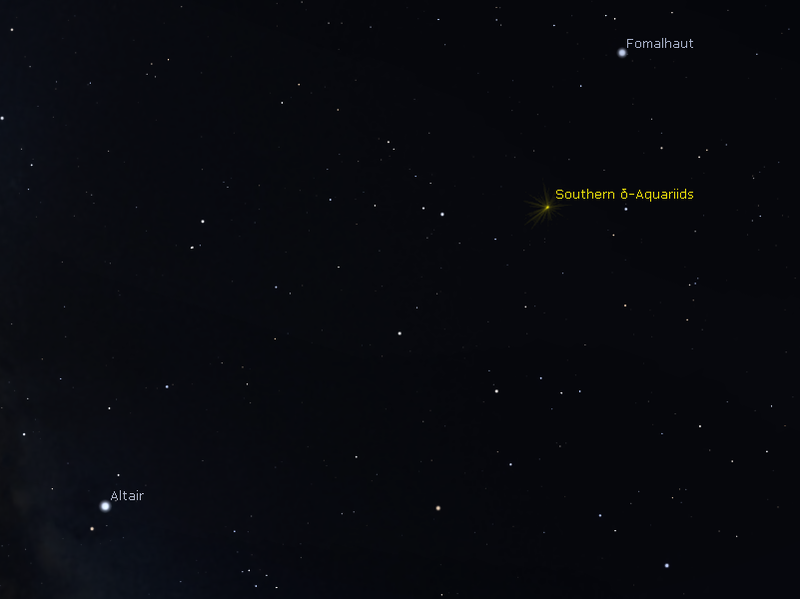 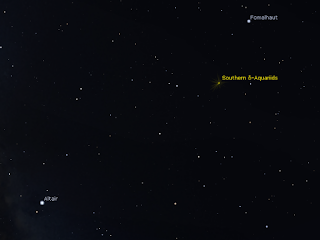 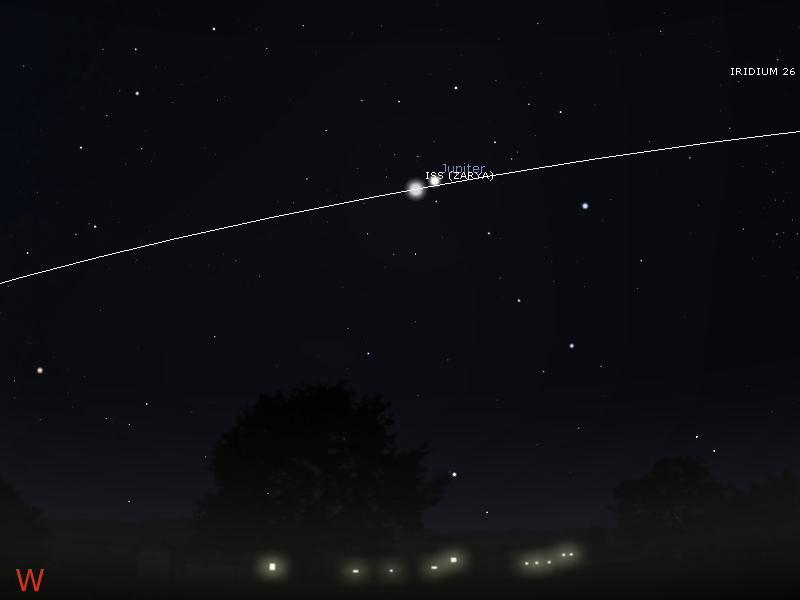 If you start observing shortly around astronomical twilight (an hour and a half after Sunset) you will be able to watch the pair coming closer together (except Perth where they are closest around astronomical twilight, and you can watch them pull apart). Photographing the pair will be a challenge, as it will be difficult to get a good exposure of Jupiter and its Moons without over exposing the Moon, you may have to make a mosiac with differnt exposure times.